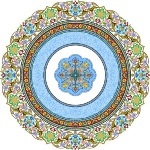 To start investigating some of the consequences of the cosmological principle of continual re-creation, we can consider the case of the throne of Bilqis, which Ibn al-Arabi (and his later commentators) have discussed in his Fusus al-Hikam and elsewhere. In most accepted understandings, motion is always associated with time, because no matter how fast objects move, they need a time greater than zero to reach any point other than their original place. For example, it is well known in physics that the photon of light is the fastest particle in the physical world and that it travels at 300,000 kilometres per second, so it can circle around the earth seven times in one second. However, this huge velocity is limited and not instantaneous, so apparently physical motions always need time. In the Qur’an, however, we read the story of the Prophet Solomon and Bilqis, the queen of Sheba, when Solomon said to his men: '"Which of you can bring me her throne before they come to me in submission?" [Then] a stalwart of the jinn said: "I will bring it to you before you can rise from your place, and I verily am strong and trusty for such work"' (27:39). [But even this really quick action takes time, though very little, so] 'said the one who has knowledge of the Book: "I will bring it to you before your gaze returns unto you!" [i.e. in less than the blink of the eye, actually immediately.] Then when he (Solomon) saw it placed steadily before him, he said: "This is by the Grace of my Lord to test me whether I am grateful or ungrateful!"' (27: 38-40). In this mysterious story it is clear that al-Khidr brought the throne of Bilqis from Yemen to al-Quds in no time. Because of its great importance in his view of time and the cosmos, Ibn al-Arabi devotes much of chapter 16 in his famous book of the Bezels of Wisdom to talk about this distinctive phenomenon of timeless motion often associated with the extra-ordinary actions and manifestations of the saints (awliya’) (Corbin 1969: 224-6). Ibn al-Arabi, however, declares that in reality this is not motion, but, rather, the throne was annihilated or extincted from its original place and instantly re-created in front of Solomon, in no time, based on the affirmation in those verses that Solomon saw the throne placed 'steadily' before him before 'he returns his gaze.' (i.e., her throne was not shaking, as one would expect when an object moves quickly and then stops suddenly, due to the deceleration.). So indeed there was no motion, but rather - as al-Qashani and Bali Effendi mentioned in their commentaries on this chapter - that all al-Khidr did was to switch the throne from its original location to the new place in front of Solomon. From this perspective this kind of phenomenon is easily explained, based on the re-creation principle, since, as Ibn al-Arabi frequently affirms, such apparent 'miracles' do not break the divine laws underlying the phenomena of nature, but only break our 'habits' of perception and expectation [II.374.27]. In fact everything that happens in Nature must be explainable under some divine laws, and is in principle possible to be repeated [II.374.11]. In terms of modern physics, this story actually corresponds to the pervasive phenomena that happen in the atom whenever an electron moves from one orbit to another, when it emits or absorbs a photon of light. It is well known in physics that when the electron absorbs or emits a photon its distance from the nucleus in the centre of the atom changes. This change of the distance, however, is abrupt: i.e., it does not travel through between the two places, but rather it disappears from its original orbit and reappears in the new orbit. Usually such kind of instantaneous motion is scarcely explained according to the novel equations of quantum mechanics, and it is not explainable at all with the classical Newton's equations (see section I.3). Indeed such inexplicable electron behaviour was the driving force behind the discovery of the successful theory of quantum mechanics. If we recall Ibn al-Arabi's definition of motion discussed in section II.6, we can easily account for this type of timeless motion. Such motion, according to Ibn al-Arabi, is not an infinitely gradual change of positions from the start to the destination, but rather a new creation in the second place. However, if we want to be very accurate, the motion of the throne of Bilqis, like the motion of electrons between orbits and indeed any elementary motion, takes a single 'Day of event' which is equivalent to a single 'atom of time' of what we may count. Measuring the time that the electron needs to switch between two successive orbs might be the key to testing Ibn al-Arabi's cosmological model and developing it in terms of modern scientific theory. This smallest instant of time is the quantum (al-zaman al-fard) of the quantized time that we have discussed in sections II.8, IV.1 and VI.5 above. In normal cases, of course the distance travelled in this smallest moment is also very short, which causes us to see gradual changes; but in principle the distance involved could be anything; as Allah wills, since whether the change in positions is small or large, the same process of re-creation is taking place. Therefore, what we call the laws of physics or mechanics, are - in terms of Ibn al-Arabi's cosmological conceptions - just a qualitative 'description' of the normally observed order of re-creation, not a real description of the actual process of perpetual re-creation. We shall see further below that this conception has a great impact on our understanding of causality; the most fundamental principle in physics. Ibn al-Arabi asserts that this person was Asif bin Barkhya who is known as al-Khadir. Al-Khadir literally means 'The Green One', a legendary figure endowed with immortal life. He represents freshness of spirit and eternal liveliness. The stories surrounding al-Khidr are usually associated with Surat al-Kahf in Qur’an [18:60–82], where Allah described the journey of Moses and his servant to the 'meeting of the two seas' to meet al-Khadir and learn from him. Ibn al-Arabi himself mentioned that he had met him several times [I.186], and he considers him a divine Messenger and one of four 'Pillars' in the spiritual hierarchy [II.5.31]. See: Fusus al-Hikam, with commentary by ‘Abd al-Razzaq al-Qashani and Bali Effendi (Al-Maktaba al-Azhariyya li-l-Turath: Cairo, 1997): 321-324. This Page has been viewed 260 times, and the number of All-Pages-Views is 107112 times, since 1/3/2019.